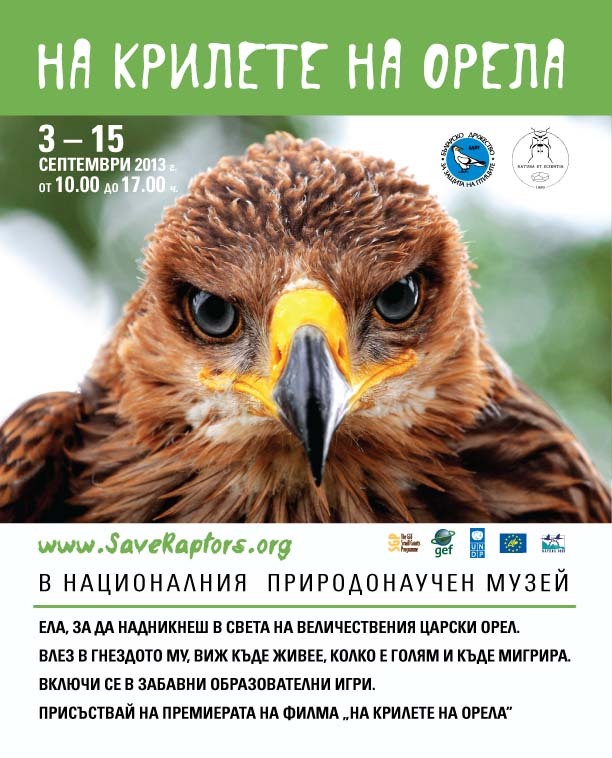 In the last days of summer the Bulgarian Society for the Protection of Birds (BSPB) and the National Museum of Natural History will organise an interactive exhibition — 'On the Wings of the Eagle'. It welcomes young and grown-up visitors from 3 to 15 of September 2013. If you are visiting the exhibition at the museum, you can peek into the world of the globally endangered Imperial Eagle. It is one of the rarest birds not only in Bulgaria but also in the whole world. Only 24 pairs of this magnificent species have left in Bulgaria. You can enter the nest of the Imperial Eagle and measure how tall you are and how much you weigh compared to the eagle. You can learn more about its habitat and about its diet. You can see where the juvenile birds migrate in the winter. You can do all this only if you visit the National Museum of Natural History and the BSPB during the interactive educational event 'On the Wings of Eagles'. Opening hours are from 10:00 to 17:00. There will be a photo exhibition in the museum lobby. The exhibition will explore the fate of the Imperial Eagle in Bulgaria and the conservation activities conducted by the BSPB. A premiere of the short movie 'On the Wings of the Eagle' will be held during the two-week event. It tells the story of one Bulgarian eagle named Burya and her wanderings and troubles. Children will be able to partake in fun educational games, quizzes and an art studio with options of colouring and decorating birds using the decoupage technique. Atelier of decoupage will be held on 4 September (Wednesday) at 11:00 AM and 9 September (Monday) at 16:00 PM. The event is organised within the project LIFE+ 'Conservation of Imperial Eagle and Saker Falcon in key areas of the Natura 2000 network in Bulgaria' and the project 'Ensuring sustainable management of Natura 2000 sites, key to the survival of globally threatened species' funded by the Small Grants Programme of the Global Environment Facility (GEF SGP).